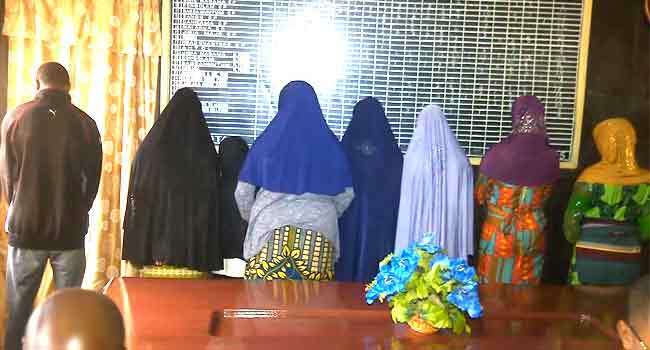 Victims of human trafficking and a suspected trafficker paraded by the Nigeria Immigration Service in Katsina State on August 15, 2018. The Nigeria Immigration Service (NIS) says it has rescued seven victims of human trafficking in Katsina State. The Comptroller of Immigration in Katsina, Mr Ajisafe Joshua, disclosed this on Wednesday during a press briefing at the Command Headquarters in the state capital. He said the personnel of the Service also arrested a woman suspected to be involved in trafficking business. Mr Joshua added that the victims, who were between the ages of 11 and 44, were rescued by officers stationed at the Jibia Magama Control Post. According to him, three of them were from Oyo State and two from Lagos while the remaining two persons were from Bayelsa and Ogun states. The Comptroller noted that with the latest development, the command has intercepted two suspects and rescued 18 victims of human trafficking in the last one month. He said the Immigration was committed to monitoring the nation’s expansive borders effectively, adding that they would not relent in their efforts to put an end to the menace and to save unsuspecting Nigerians from wicked people.